There is perhaps no scientific catchphrase that has better embedded itself in colloquial speech than “survival of the fittest.” (Yet, one must wonder how many people out there throw this phrase around willy-nilly, without any notion of the man behind it all: Mr. Darwin himself.) 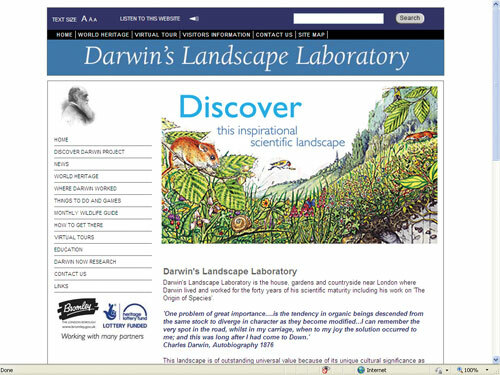 Darwin’s Landscape Library is an excellent website for people curious about the man—or at least, the place where the man lived—as “landscape library” refers to the house, gardens, and countryside near where Darwin lived and worked on his seminal “The Origin of Species.” The site includes virtual tours of the area, a monthly wildlife guide, and a number of educational resources for younger students. (My favorite—“Mrs. Charles Darwin’s Advice for Walking Upright.”) Even for those of us familiar with Darwin’s scientific work, this site provides interesting insight into the context of his observations.